"This new art: To draw in space." Despite Julio González's late start and short creative period of work, marked by poverty and war, he realized key works that capture his radical approach to sculpture. 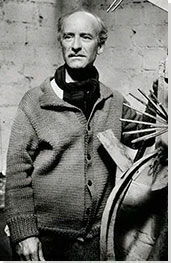 The strong ties to the local craft traditions in Barcelona informed his image of form and his choice of material with the formidable training and his acquired welding skills during WWI allowed him to combine fully contradictory concepts of the modern - from Cubism, Surrealism, Constructivism, to various forms of abstraction - in his sculptures. And especially influential was González's intensive collaboration with Pablo Picasso. Although González never gained broad popularity, he is known as the father of iron sculpture and is consistently included among the famous modern sculptors of the 20th century, such as Brancusi, Giacometti, Laurens, and Picasso. González chose iron as his metal of choice, because of his objection to its modern uses for munitions and for society's mechanized, scientific environment. He aimed to transform this metal into evocative forms. The method of collage informs his process of welding together disparate pieces of metal, even found scraps of metal and bars, creating arabesque-like delineations in space to capture the human experience of beauty and defiance. González, inspired by Rodin, left visible the process of making, such as chasing the subject out of the metal, the marks of beating the metal into shape, or showing the skeletal elements used in welding a piece together. The material's unfinished, rough surface or scrap iron pieces expressed the object's corporeality and lent it an emotive quality, which was intended to shape the viewer's perception of the work. For the first time, González used welded metal as a new medium and technique for sculpture. Influenced by Picasso's revolutionizing attitude toward the dialogue between painting and sculpture, González began to depict forms in space in his own sculptural work. He therefore understood space as a new material to manipulate and to construct with. This led eventually to González's own invention of drawing in space, which meant using the given lines and surfaces in the material to create open constructions in and with space suggestive of the female figure or human body. Drawing provided González with the opportunity to try out his ideas and even occupy himself, when sculpting materials were scarce. They reveal his sense of color and the importance of light and shadow in the composition of spatial form. González's Catalan roots led to his deep connection with the Republican cause in Catalonia and Spain's defiance against the fascist threat. 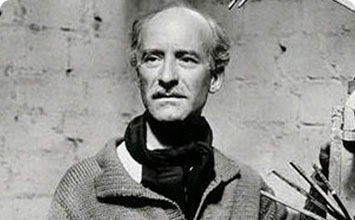 His pessimism toward the Spanish Civil War colored his political sympathies, which can be seen in his drawings and sculptures. González was born Julio González Pellicer in Barcelona to a family descended from a long line of metal smiths. As a child, he began learning decorative metal working in his father's workshop. His father, Concordio González, was a part-time sculptor, and his mother, Pilar Pellicer Fenés, came from a long line of well-known artists, her father having been an important 19th century Catalan illustrator and designer. As the youngest of four children, González was particularly close to his mother and to his older brother, Joan. As his family loved music, he learned to play the mandolin at an early age to accompany his singing. He attended a Catholic school that followed the educational model of medieval craft guilds, where technical training was highly valued. Gonzalez depicts the introspective mood of a young woman through the way her head leans forward, her calm facial expression, and her closed eyes. He draws upon his technical expertise in repoussé in these early small busts. This metalworking technique allowed for greater plasticity, as can be seen in the shape of the woman's head, an enclosed globe, the soft modeling of her face, the texture of her hair. The palpable sense of form not only anticipates his abstract, cubist heads of the 1930s, it also evokes Rodin's emphasis on corporeality. Gonzalez thus took his first step towards dissolving the fully plastic round volume into geometric form. He would rely more and more on the viewer's perception to associate the abstracted forms, a globe (head) and cylinder (neck), surfaces and lines, as referencing the head, face, or figure of a woman. Yet parallel to Rodin, Gonzalez reveals his process of making. He leaves exposed the marks of beating the metal sheets into the shape of the head to capture a simple human moment, a young woman lost in thought. In this small sculpture, only 7 1/2 inches long, a couple reclines, embracing each other. Yet, these figures are essentially abstract forms. It is the sense of interlocking and enclosed spaces rather than volume that contribute a human quality to these forms. The linear and geometric surfaces of the welded unmodified scrap iron pieces make apparent the influence of Cubism; the way scrap iron bars become arms and legs, flat slabs become the torso. The stylized heads reflect Gonzalez's fascination with the Etruscan couple reclining on a sarcophagus that he studied in visits to the Louvre. The influence of Luca Cambiaso, an Italian 16th-century artist who often sketched human figures geometrically, reducing them to cube forms, can also be seen in the work. The spatial construction of line and surfaces create a feeling that these two figures, this couple, are not only welded together physically, but emotionally. From a series of approximately ten drawings, this collage-drawing depicts a female figure with red spiraling curved legs that connect to a penciled skeletal torso supported by a thick inked black line that rises and contracts into a thin line to intersect with a sketched winged right arm. The figure's left arm is delicately hinged and held in place by a line extending out to suggest a shoulder. This same line defines the curve of the neck that ends in a circle for the head with two black dots for eyes. The left arm extends forward in a bold gesture, underscored by its wide, black and green curving shape. At its extremity, a hand seems to curve upward in the gesture of holding something. A white rectangular paper, symbolizing a mirror, hovers near the left hand. In this work two curving pieces of metal, one with a foot like extension with five toes reaching back, rise into a long slab of metal that lifts to a round metal circle on the right and a rectangular metal box on the left. This ensemble of curved lines and surfaces articulates Gonzalez's practice of interrelating his drawing and sculpting (welding). His work in the mid-1930s became strikingly abstract and remarkably open, as welding allowed his metal sheets and rods to be like lines drawn in the air. This sculpture is made of a cylinder resting upon a trapezium to which it is connected by thin curving bars on both sides. Another thicker bar of metal connects the base of the trapezium to the base of the cylinder. Steel triangles are suspended in the opening of the cylinder, and a bar with two angular arms rises out of the top. It reveals Gonzalez's artistic maturity, resulting from his two year collaboration with Picasso (1929-30). This significant sculpture depicts a peasant woman, holding a child in her left arm, and a sickle, a traditional agricultural tool, in her right hand, as she steps forward resolutely on the wooden base and looks up toward the sky. This modern madonna and child references the Madonna - the "Black Madonna" at the Monastery of Saint Montserrat - as well as the Catholic faith at the heart of Spanish culture. The life-sized sculpture is uncharacteristically naturalistic, and reminiscent of Gonzalez's oil painting, Peasant Woman Sitting (1919-1920) that depicted a peasant woman in similar dress and holding a sickle. The title of the piece refers to the Montserrat mountains near Barcelona, a traditional symbol of the artist's native province of Catalonia, and is also a common name given to women from the area. The sickle was a symbol used in the Revolution of 1936, at the onset of the Spanish Civil War, when the province defeated the Spanish Nationalist rebels who attempted to overthrow the left-wing Popular Front Spanish government. In this work, made out of scrap metal, a dark mask with its eyes formed by ragged openings and its edges torn opens its mouth in a scream that captures the universal expression of despair and anguish in the face of a duplicitous and unjust civil war. This sculpture depicts a humanoid figure with cactus-like legs, a five-fingered arm rising vertically from the hip, and a tubular torso rising to a hat-like head. The left arm is a kind of drum with five fingers above a horizontal phallic bar. Metal nails erupt from the figure, like cactus spines, influenced, perhaps by the use of nails in Picasso's 1926 Guitar. This defiant, prickly figure symbolizes the republican cause during the Spanish Civil War. From April 1941 to May 1941, the artist completed eight drawings of a woman with a veil of which this is the last. The first drawings were more realistic in style, but the later works, as shown here, are agonized and distorted and influenced by Cubism and African masks. Originally wanting to depict the Virgin Mary, he creates a figure, shrouded in white, the color of mourning, to evoke her as suffering the anguish of humanity during World War II. In its focus on a scream, the work revisits The Screaming Head of Montserrat, but the Cubist treatment emphasizes an element of outrage. Divided into light and dark planes, the face suggests a sensibility torn into pieces by conflict, and the mouth depicted in profile seems to shout into the darkest area in the drawing, as if to denounce the impending darkness that would engulf Spain.